These condos are beautifully decorated and some have upgraded flooring, cabinets and counter tops. Some units also have added amenities such as smart televisions, high thread count bedding and stainless steel appliances. Stay in the Scenic Meadow Area Across From Mammoth Creek. Near both of Mammoths golf courses, and Mammoth Creek Park. On the Free Winter Red Shuttle Route & Free Summer Trolley route Starting At Mammoth Creek Park. Sunrise at Mammoth features Pool (Summer), Hot Spa, Dry Sauna and Views of the Shewrins. 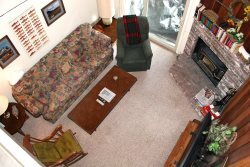 Enjoy Mammoth from either a 1 bedroom 1 bath or 1 & loft 2 bath condominium.